Here's all the information you need to respond to cardiac emergencies in one pocket-sized book! This quick-reference guide provides easy-to-access coverage of all three levels of care--infant, child, and adult--plus listings for all drugs required for ACLS and PALS in both adult and pediatric dosages. 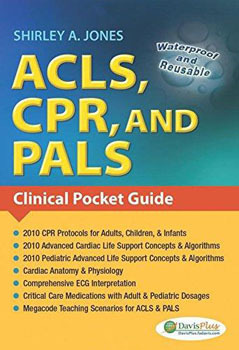 You'll also find the latest in PALS concepts and protocols and the ACLS guidelines. Critical-thinking exercises and megacodes make it an ideal resource to help you prepare for certification and recertification exams. Waterproof, write-on/wipe off pages are HIPAA-compliant and great for on the go. Includes ACLS, CPR, and PALS guidelines. Lists the drugs required for ACLS and PALS, including adult and pediatric dosages. Covers PALS concepts and protocols that are unique to the newborn, infant, and pediatric patient, including formulas. Identifies important clinical implications in "Clinical Tips".